This article is about the legendary substance. For other uses, see Philosopher's Stone (disambiguation). 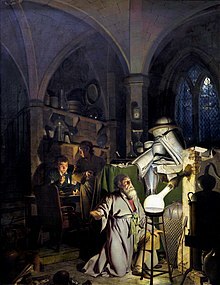 The Alchymist, in Search of the Philosopher's Stone by Joseph Wright of Derby, 1771. The philosopher's stone, more properly philosophers' stone or stone of the philosophers (Latin: lapis philosophorum) is a legendary alchemical substance capable of turning base metals such as mercury into gold (chrysopoeia, from the Greek χρυσός khrusos, "gold", and ποιεῖν poiēin, "to make") or silver. It is also called the elixir of life, useful for rejuvenation and for achieving immortality; for many centuries, it was the most sought goal in alchemy. The philosopher's stone was the central symbol of the mystical terminology of alchemy, symbolizing perfection at its finest, enlightenment, and heavenly bliss. Efforts to discover the philosopher's stone were known as the Magnum Opus ("Great Work"). The earliest known written mention of the philosopher's stone is in the Cheirokmeta by Zosimos of Panopolis (c. 300 AD). Alchemical writers assign a longer history. 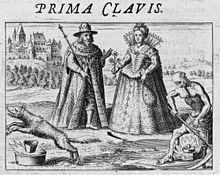 Elias Ashmole and the anonymous author of Gloria Mundi (1620) claim that its history goes back to Adam who acquired the knowledge of the stone directly from God. This knowledge was said to be passed down through biblical patriarchs, giving them their longevity. The legend of the stone was also compared to the biblical history of the Temple of Solomon and the rejected cornerstone described in Psalm 118. The theoretical roots outlining the stone’s creation can be traced to Greek philosophy. Alchemists later used the classical elements, the concept of anima mundi, and Creation stories presented in texts like Plato's Timaeus as analogies for their process. According to Plato, the four elements are derived from a common source or prima materia (first matter), associated with chaos. Prima materia is also the name alchemists assign to the starting ingredient for the creation of the philosopher's stone. The importance of this philosophical first matter persisted throughout the history of alchemy. In the seventeenth century, Thomas Vaughan writes, "the first matter of the stone is the very same with the first matter of all things". Early medieval alchemists built upon the work of Zosimos in the Byzantine Empire and the Arab empires. Byzantine and Arab alchemists were fascinated by the concept of metal transmutation and attempted to carry out the process. The 8th-century Muslim alchemist Jabir ibn Hayyan (Latinized as Geber) analyzed each classical element in terms of the four basic qualities. Fire was both hot and dry, earth cold and dry, water cold and moist, and air hot and moist. He theorized that every metal was a combination of these four principles, two of them interior and two exterior. From this premise, it was reasoned that the transmutation of one metal into another could be affected by the rearrangement of its basic qualities. This change would be mediated by a substance, which came to be called xerion in Greek and al-iksir in Arabic (from which the word elixir is derived). It was often considered to exist as a dry red powder (also known as al-kibrit al-ahmar, red sulfur) made from a legendary stone—the philosopher's stone. The elixir powder came to be regarded as a crucial component of transmutation by later Arab alchemists. In the 11th century, there was a debate among Muslim world chemists on whether the transmutation of substances was possible. A leading opponent was the Persian polymath Avicenna (Ibn Sina), who discredited the theory of transmutation of substances, stating, "Those of the chemical craft know well that no change can be effected in the different species of substances, though they can produce the appearance of such change." According to legend, the 13th-century scientist and philosopher Albertus Magnus is said to have discovered the philosopher's stone. Magnus does not confirm he discovered the stone in his writings, but he did record that he witnessed the creation of gold by "transmutation". The 16th-century Swiss alchemist Paracelsus (Philippus Aureolus Theophrastus Bombastus von Hohenheim) believed in the existence of alkahest, which he thought to be an undiscovered element from which all other elements (earth, fire, water, air) were simply derivative forms. Paracelsus believed that this element was, in fact, the philosopher's stone. The smattering I have of the Philosophers stone, (which is something more than the perfect exaltation of gold) hath taught me a great deale of Divinity. A mystical text published in the 17th century called the Mutus Liber appears to be a symbolic instruction manual for concocting a philosopher's stone. Called the "wordless book", it was a collection of 15 illustrations. The equivalent of the philosopher's stone in Buddhism and Hinduism is the Cintamani. It is also referred to as Paras/Parasmani (Hindi: पारस/पारसमणि) or Paris (Marathi: परिस). In Mahayana Buddhism, Chintamani is held by the bodhisattvas, Avalokiteshvara and Ksitigarbha. It is also seen carried upon the back of the Lung ta (wind horse) which is depicted on Tibetan prayer flags. By reciting the Dharani of Chintamani, Buddhist tradition maintains that one attains the Wisdom of Buddhas, is able to understand the truth of the Buddhas, and turns afflictions into Bodhi. It is said to allow one to see the Holy Retinue of Amitabha and his assembly upon one's deathbed. In Tibetan Buddhist tradition the Chintamani is sometimes depicted as a luminous pearl and is in the possession of several of different forms of the Buddha. Within Hinduism it is connected with the gods Vishnu and Ganesha. In Hindu tradition it is often depicted as a fabulous jewel in the possession of the Nāga king or as on the forehead of the Makara. The Yoga Vasistha, originally written in the 10th century AD, contains a story about the philosopher's stone. A great Hindu sage wrote about the spiritual accomplishment of Gnosis using the metaphor of the philosopher's stone. Saint Jnaneshwar (1275–1296) wrote a commentary with 17 references to the philosopher's stone that explicitly transmutes base metal into gold. The seventh century Siddhar Thirumoolar in his classic Tirumandhiram explains man's path to immortal divinity. In verse 2709 he declares that the name of God, Shiva is an alchemical vehicle that turns the body into immortal gold. The most commonly mentioned properties are the ability to transmute base metals into gold or silver, and the ability to heal all forms of illness and prolong the life of any person who consumes a small part of the philosopher's stone. Other mentioned properties include: creation of perpetually burning lamps, transmutation of common crystals into precious stones and diamonds, reviving of dead plants, creation of flexible or malleable glass, or the creation of a clone or homunculus. Numerous synonyms were used to make oblique reference to the stone, such as "white stone" (calculus albus, identified with the calculus candidus of Revelation 2:17 which was taken as a symbol of the glory of heaven), vitriol (as expressed in the backronym Visita Interiora Terrae Rectificando Invenies Occultum Lapidem), also lapis noster, lapis occultus, in water at the box, and numerous oblique, mystical or mythological references such as Adam, Aer, Animal, Alkahest, Antidotus, Antimonium, Aqua benedicta, Aqua volans per aeram, Arcanum, Atramentum, Autumnus, Basilicus, Brutorum cor, Bufo, Capillus, Capistrum auri, Carbones, Cerberus, Chaos, Cinis cineris, Crocus, Dominus philosophorum, Divine quintessence, Draco elixir, Filius ignis, Fimus, Folium, Frater, Granum, Granum frumenti, Haematites, Hepar, Herba, Herbalis, Lac, Melancholia, Ovum philosophorum, Panacea salutifera, Pandora, Phoenix, Philosophic mercury, Pyrites, Radices arboris solares, Regina, Rex regum, Sal metallorum, Salvator terrenus, Talcum, Thesaurus, Ventus hermetis. Many of the medieval allegories for a Christ were adopted for the lapis, and the Christ and the Stone were indeed taken as identical in a mystical sense. The name of "Stone" or lapis itself is informed by early Christian allegory, such as Priscillian (4th century), who stated Unicornis est Deus, nobis petra Christus, nobis lapis angularis Jesus, nobis hominum homo Christus. In some texts it is simply called 'stone', or our stone, or in the case of Thomas Norton's Ordinal, "oure delycious stone". The stone was frequently praised and referred to in such terms. It needs to be noted that philosophorum does not mean "of the philosopher" or "the philosopher's" in the sense of a single philosopher. It means "of the philosophers" in the sense of a plurality of philosophers. The first key of Basil Valentine, emblem associated with the 'Great Work' of obtaining the Philosopher's stone (Twelve Keys of Basil Valentine). Descriptions of the Philosopher's Stone are numerous and various. According to alchemical texts, the stone of the philosophers came in two varieties, prepared by an almost identical method: white (for the purpose of making silver), and red (for the purpose of making gold), the white stone being a less matured version of the red stone. Some ancient and medieval alchemical texts leave clues to the physical appearance of the stone of the philosophers, specifically the red stone. It is often said to be orange (saffron colored) or red when ground to powder. Or in a solid form, an intermediate between red and purple, transparent and glass-like. The weight is spoken of as being heavier than gold, and it is soluble in any liquid, yet incombustible in fire. Alchemical authors sometimes suggest that the stone's descriptors are metaphorical. The appearance is expressed geometrically in Michael Maier's Atalanta Fugiens. "Make of a man and woman a circle; then a quadrangle; out of this a triangle; make again a circle, and you will have the Stone of the Wise. Thus is made the stone, which thou canst not discover, unless you, through diligence, learn to understand this geometrical teaching." Rupescissa uses the imagery of the Christian passion, telling us it ascends "from the sepulcher of the Most Excellent King, shining and glorious, resuscitated from the dead and wearing a red diadem...". The various names and attributes assigned to the philosopher's stone has led to long-standing speculation on its composition and source. Exoteric candidates have been found in metals, plants, rocks, chemical compounds, and bodily products such as hair, urine, and eggs. Justus von Liebig states that 'it was indispensable that every substance accessible... should be observed and examined'. Alchemists once thought a key component in the creation of the stone was a mythical element named carmot. Esoteric hermetic alchemists may reject work on exoteric substances, instead directing their search for the philosopher's stone inward. Though esoteric and exoteric approaches are sometimes mixed, it is clear that some authors "are not concerned with material substances but are employing the language of exoteric alchemy for the sole purpose of expressing theological, philosophical, or mystical beliefs and aspirations". New interpretations continue to be developed around spagyric, chemical, and esoteric schools of thought. The philosopher's stone is created by the alchemical method known as The Magnum Opus or The Great Work. Often expressed as a series of color changes or chemical processes, the instructions for creating the philosopher's stone are varied. When expressed in colors, the work may pass through phases of nigredo, albedo, citrinitas, and rubedo. When expressed as a series of chemical processes it often includes seven or twelve stages concluding in multiplication, and projection. The philosopher's stone has been an inspiration, plot feature, or subject of innumerable artistic works: animations, comics, films, musical compositions, novels, and video games. ^ Stanton J. Linden. The alchemy reader: from Hermes Trismegistus to Isaac Newton Cambridge University Press. 2003. p. 29. ^ a b Strohmaier, Gotthard (2003). "Umara ibn Hamza, Constantine V, and the invention of the elixir". Hellas im Islam: Interdisziplinare Studien zur Ikonographie, Wissenschaft und Religionsgeschichte. Otto Harrassowitz Verlag. pp. 147–150. ISBN 9783447046374. ^ Julian Franklyn and Frederick E. Budd. A Survey of the Occult. Electric Book Company. 2001. p. 28-30. ISBN 1-84327-087-0. ^ Guénon, René (2004) (1962). Symbols of Sacred Science. Sophia Perennis, USA. ISBN 0-900588-78-0. pp. 277. ^ Venkatesananda, Swami (1984). The Concise Yoga Vasistha. Albany: State University of New York Press. pp. 346–353. ISBN 0-87395-955-8. OCLC 11044869. ^ listed e.g. in W. Schneider, Lexikon alchemistisch-pharmazeutischer Symbole, Weinheim 1962. ^ Corpus Scriptorum Ecclesiasticorum Latinorum t. XVIII, p. 24, cited by C. G. Jung in Roots of Consciousness. ^ Line 744 in Thomas Norton's The Ordinal of Alchemy by John Rediry. The Early English Text Society no. 272. ^ A German Sage. A Tract of Great Price Concerning the Philosophical Stone. 1423. ^ John Frederick Helvetius. Golden Calf. 17th Century. ^ John Read. From Alchemy to Chemistry London: G. Bell. 1957. p. 29. ^ Burt, A.L. 1885. The National Standard Encyclopedia: A Dictionary of Literature, the Sciences and the Arts, for Popular Use p. 150. Available online. ^ Sebastian, Anton. 1999. A Dictionary of the History of Medicine. p. 179. ISBN 1-85070-021-4. Available online. ^ Stanton J. Linden. The alchemy reader: from Hermes Trismegistus to Isaac Newton Cambridge University Press. 2003. p. 16. ^ Eric John Holmyard. Alchemy Courier Dover Publications, 1990. p. 16. ^ Shah, Idries (1977) . The Sufis. London, UK: Octagon Press. pp. 192–205. ISBN 0-86304-020-9. Encyclopædia Britannica (2011). Philosophers' stone and Alchemy. Guiley, Rosemary (2006). The Encyclopedia of Magic and Alchemy. Infobase Publishing, USA. ISBN 0-8160-6048-7. pp. 250–252. Myers, Richard (2003). The basics of chemistry. Greenwood Publishing Group, USA. ISBN 0-313-31664-3. pp. 11–12. Pagel, Walter (1982). Paracelsus: An Introduction to Philosophical Medicine in the Era of the Renaissance. Karger Publishers, Switzerland. ISBN 3-8055-3518-X. Marlan, Stanton (2014). 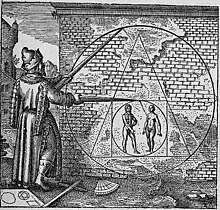 The Philosophers' Stone: Alchemical Imagination and the Soul's Logical Life. Doctoral dissertation, Duquesne University. Thompson, Charles John Samuel (2002) . Alchemy and Alchemists. Chapter IX. Courier Dover Publications, USA. ISBN 0-486-42110-4. pp. 68–76. Wikimedia Commons has media related to Philosopher's stone.